How the Indian polity is evolving? How the ground-realities are evaded? Yes, there is also a historical cycle to this phenomenon of holding on to power, from ancient Greece to modern day Indian democratic realities! 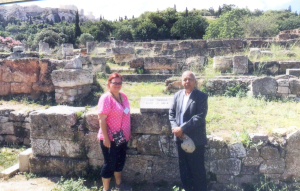 The Greece we visited recently as a family tour, we mean the journey to the ancient classical Greece of the 5th century BC when the Greek democratic ideal reached its peak under the ancient general and statesman Pericles had its ups and downs. Of course we all admire the ancient Greek ideal of democracy but then it had its other side, rule by tyrants, rule by the oligarchs and also the rule by the 500, the rule by the 30, all the demos and also when the Greece country had its unparallel thinkers, artists, sportsmen and orators and educators called the sophists and many other brilliant citizens. How can we come out of Greece without recalling the mind soaring Parthenon acropolis temple, built in all white special marble and the names who created such a world wonder and also the sculptors, sportsmen who gave the world the Olympic Games etc. It is altogether a very inspiring story when we walked on the very spoiled, the very path traversed by Socrates, Plato and Aristotle. It is a different story right now, today when we see the decline of modern Greece and the one right now saved by three successive bailouts by the European Union! Simply because in India, we all seem to acknowledge and also feel certain pride in saying that India, after centuries of slavery under successive foreign occupiers, have become the world’s greatest democracy with 1.3 billion demos! Yes, that is something about which every Indian must feel proud. So, our emphasis on certain basic features and certain values of democracy. How fair, how reasonable and how ethical are our political institutions that make up our democracy? Here, we like to share with our countrymen some serious reservations. Yes, the fundamentals, like the Constitution, are strong and almost well-founded. But there are certain grave issues too. There is an unsaid conspiracy of sorts among the elite in the country. We seem to have a very poor opinion of ourselves when it comes to practise what we preach. There is a ruling party with certain ideologies, however imperefct. But we don’t seem to believe in a robust Opposition Party or parties. See the plight of the Congress. It is now almost limping, so to say. It is bogged down in dynasty. Rahul Gandhi is simply unfit, many say, why even the Congress insiders, the seniors say for themselves! We have interacted with some of the seniors. We can even name them or quote them. Yet, they seem to secretly entertain the fear they might lose their privileges like living in Delhi and getting the small crumbs of like other perks, both monetary and also some network connections. Why the seniors must hang on with jobs in the party, very minor assignments like leading some delegations etc. They occupy prime real estate in Delhi and they enjoy vulgar satisfaction of leading a political life! And Rahul enters this murky world and also proves himself in the public eye what he is capable of. Young men and women must enter politics, fine. But there is some criticism that you must prove your talents for leading a large party like the Congress. So, to stick to a dynasty and claim to nurture democracy seems gross error. As for other Opposition parties, here too there is some confusion. Nitish Kumar, the Bihar CM, is another contradiction. What is his articulation of any alternative political path? How can you destroy Opposition unity and in Bihar you still cling on to the mandate that was given for a different combination. Corruption? OH, a very boring and dull topic. The only contribution of Modi regime so far is to keep a studied silence on corruption. May be, the PM has his own sound reasons not to mention corruption as a high priority. The real losers are the poor! So, the Indian democracy is seriously flawed and the times we live through are also very unpalatable. The Election Commission, the Supreme Court wants to pursue the politicians who have accumulated assets in dubious manner to be investigated. Who doesn’t know that the EC is toothless and the political class doesn’t want to give powers to the EC, reform the EC to make it truly a watchdog of the clean political space. Also, there is a great deal of arbitrariness in governance. Many of the sensitive institutions, from human rights to anti-corruption bodies that are not functional. Corporate power is another issue. If you are a Socialist in the old fashioned way, believe in controlling economic inequality in the economy and society, you would really be a critic of Capitalism. The BJP heavyweights don’t open their mouths in this area. Neither they seem be worried about ethics in governance, so corruption is spreading like wild fire! So, democracy in India while taking roots there are also certain dangers. History has many facets. We don’t know how much history agitates the BJP think-tanks. You can’t just live for a five year term politics only, right? You have to have a vision, to use a very tired phrase! A nation, a people, an ideology must have a historic context. Let thinking sections, the elite, not the Delhi-based cynical retoured bureaucracy, the ones who don’t have any stake other than living there till the end can take such a view. Not the ones who have some serious idealism and commitment to great ideas! Let Indians of the younger generation dream at least!